This letter was written by Edward C. Clarke (1836-18xx) to his brother-in-law Cyrillo Southworth Lincoln (1830-1900). Edward was the youngest son of Lorenzo Warner Clarke (1787-1856) and Laura Turner (1793-1875) of Naples, Ontario County, New York. He received a commission as 2nd Lieutenant of Co. M, 4th New York Heavy Artillery on 19 January 1864. 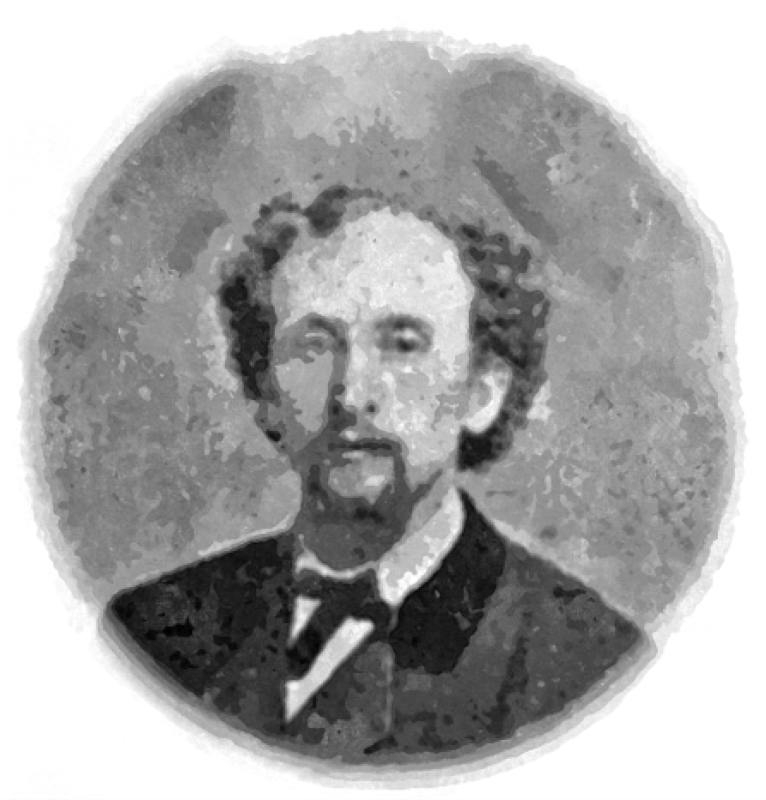 He participated in the Overland Campaign of 1864 with the Army of the Potomac as ordinance officer in the Artillery Brigade of the 5th Army Corps. He was discharged 28 September 1864 from Seminary Hospital in Georgetown for disability. His occupation was a teacher before and after the war. His brother, William Warner Clarke was the Lt-Col of the 85th New York Infantry during most of the war. In 1859, Cyrillo Southworth Lincoln (1830-1900) married Charlotteville, New York native Mary Abigail Brown, with whom he had one daughter, whose name has been lost to history. Both Mary and her infant daughter died within a year of her marriage to Lincoln, and in August 1862 he remarried to Laura Ann Clarke, and this union produced two children, Mary Clark (born 1864) and Spencer Francis (1868-1944). Your letter of the 24th stating that you had not heard from me since I was at Albany was received last night. I wrote you the 21st inst., I think, giving you an account of my “muster.” Believing that the letter has been received ere this, I will but briefly state the facts in this. I was “mustered” January 19th to rank [of 2nd Lt.] and draw pay from that date. Only an order from the Adjutant General will secure a muster back. I shall try for that. I can be mustered back at any time I ____ such order. I am now doing duty in Co “120” as * hoped. I find enough to give me good exercise both of body and mind. Sometimes I even get quite tired out. I enjoy my rest all the better. I have had command of the company for the last 3 days, drilling them and taking them out on dress parade which for a novice dealing with old soldiers is rather embarrassing and of course I have had to study tactics diligently. I find there is a great difference between theory and practice in military as well as farming or teaching. A man may study tactics simply a lifetime and not be able to drill a squad or do the duties of an officer generally, but put that study with practice and he makes a efficient instruction. I am doing very well indeed, they say about me, although I have made a good many mistakes — one of them decidedly ludicrous and quite mortifying. I was on dress parade the first time and in sheathing my sword, I managed to get it in the scabbard wrong side around, and it would not go down, and was rather inclined to stick there and not go either way after my having jammed it halfway down or so. However, I succeeded in getting it started right finally and it slid down very gracefully. 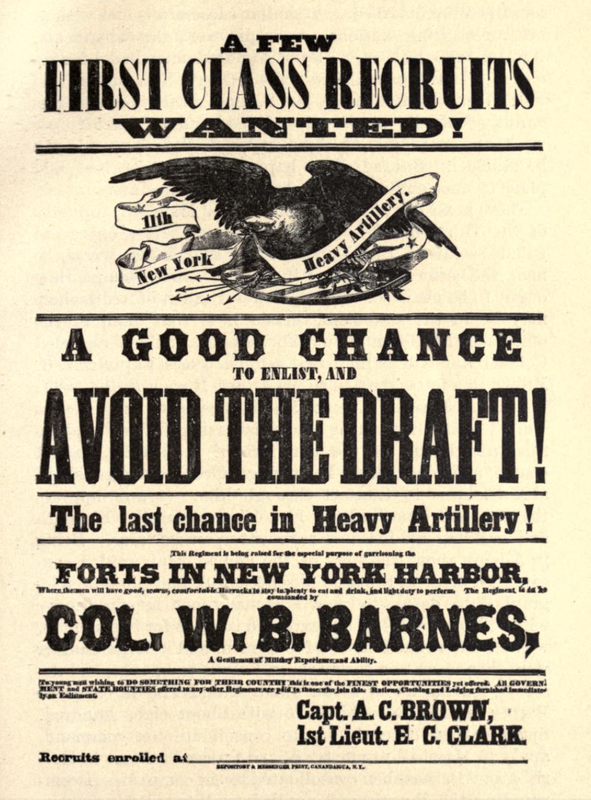 A recruiting poster for the New York Heavy Artillery with Brown’s and Clark’s names on it. As I managed to keep cool for a wonder, it gave the semblance of an accident rather than a result of ignorance as it really was. You must bear in mind that at dress parade we have the whole regiment behind us and spectators by the score in front which makes a mistake of any kind embarrassing. But I find so many others — and many of them old officers — that are constantly making worse blunders that I am quite consoled. I wrote you about some men from Ontario county who wanted to get into the 4th [Heavy Artillery] and in the company where Brown & I were and asking you to get word to them if possible that Co H ([Augustus C.] Brown’s Company) is full and have them speak for Co M. If you will do so, I will be greatly obliged. ____ send word by the Naples boys to Elmira or write them of the boys are all there. I can’t take the time this morning to defend Brown. You are certainly mistaken in regard to his doings as I can ______ _____ you. He might have done more for me by resigning and giving me his place but that is the only way since the 21st of June. I was right glad to hear the news from Naples and will write in reply soon. This is only to relieve your anxiety. Reading about Lincoln is always a great pleasure, I think you have a great collections of letters and it’s awesome.